Everyone goes away from time to time, whether it's on vacation, a weekend to visit family, or a business trip. 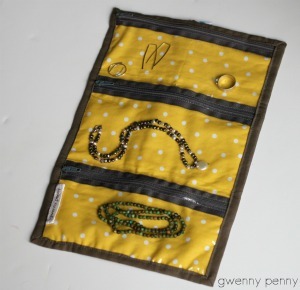 Why not give them something handmade to carry their jewelry in while they're away? The finished organizer is about 8" x 12" when it's opened up, 8" x 4 1/4" when it's folded. This project involves vinyl, but don't let that scare you. This was only my second time sewing with vinyl, and this project went together smoothly without any hiccups. Ready to give it a try? Let's go! Step 1: Cut your vinyl, interior fabric, and fusible fleece. You will need to cut three pieces of vinyl: 4 1/4" x 8", 5 1/8" x 8", and 3 7/8" x 8". Cut your interior fabric 8" x 13". Cut your fusible fleece 7 3/4" x 12 3/4". Center the fusible fleece on the wrong side of your interior fabric and fuse in place following the manufacturer's directions. Step 2: Start with the 4 1/4" x 8" piece of vinyl. 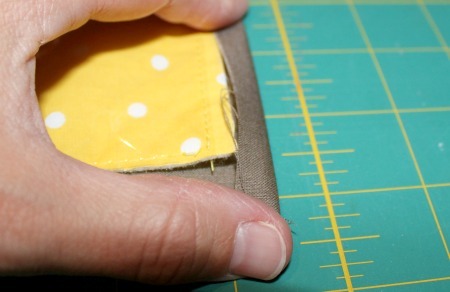 Fold the top long edge under 3/8" and crease. If you press along the entire fold, the vinyl will stick to itself, which is helpful. 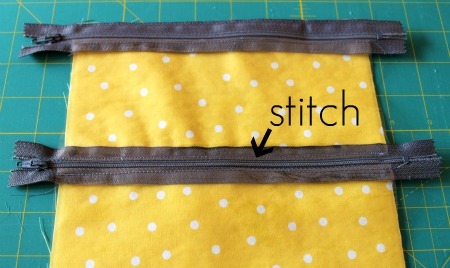 Take one of your zippers and lay it right side up with the zipper pull on the left. 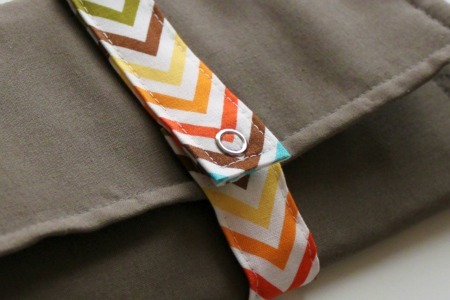 Lay your vinyl piece along the bottom edge of the zipper with the folded edge of the vinyl against the zipper. 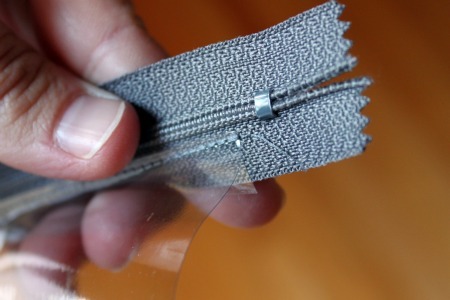 Use a zipper foot to attach the vinyl to the zipper by sewing along the entire length about 1/16" to 1/8" from the fold in the vinyl. Don't use pins or you will put holes in your vinyl. Just go slowly and hold it together with your fingers. Repeat this for your 5 1/8" piece of vinyl and your second zipper. Repeat again for your 3 7/8" piece of vinyl and your third zipper. Step 3: Time to start assembling the interior of the organizer. Lay your interior fabric right side up. 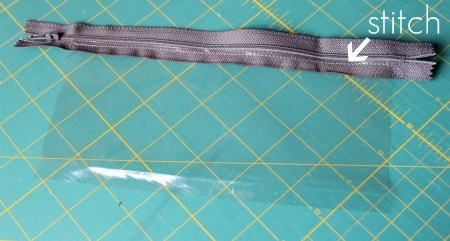 Take your first vinyl/zipper combination (4 1/4") and line up the top of the zipper with the top of the interior fabric. The zipper/vinyl piece should also be right side up. Baste along the top edge using a very long stitch about 1/8" from the edge. Step 4: Take the bottom edge of the vinyl piece that you just attached and fold it under 3/8", creasing along the entire length. 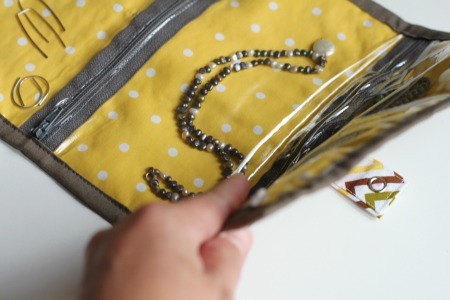 Take your second vinyl/zipper combination (5 1/8") and lay it out across your interior fabric, overlapping the fold you just created along the bottom of the first piece of vinyl over the top of the second zipper. 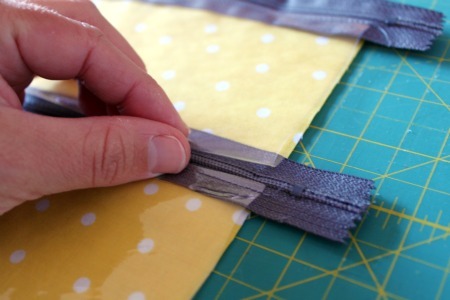 Use a zipper foot to attach the first piece of vinyl to the second zipper and the interior fabric by sewing along the entire length of the zipper about 1/16" to 1/8" from the fold in the vinyl . This creates your first pocket. 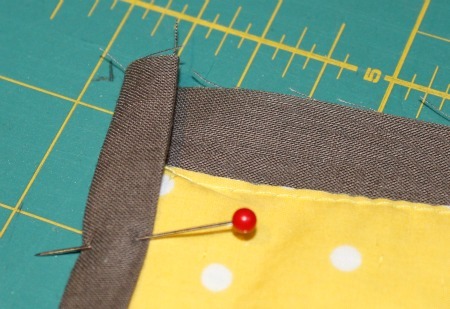 Important: You can't pin any of this together unless you just pin the very edges. You don't want to put holes in the vinyl. I didn't use pins. I moved slowly and carefully, stopping to measure about every inch to make sure that the distance between the first and second zipper was consistent. Step 5: Take the bottom edge of the second vinyl piece that you just attached and fold it under 3/8", creasing along the entire length. 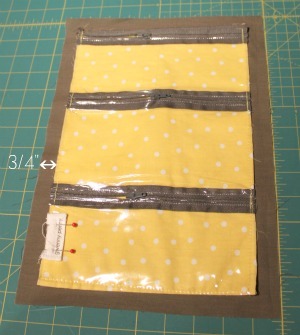 Take your third vinyl/zipper combination (3 7/8") and lay it out across your interior fabric, overlapping the fold you just created along the bottom of the second piece of vinyl over the top of the third zipper. 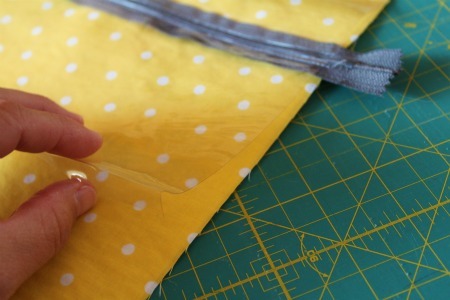 Use a zipper foot to attach the second piece of vinyl to the third zipper and the interior fabric by sewing along the entire length of the zipper about 1/16" to 1/8" from the fold in the vinyl . This creates your second pocket. Step 6: Baste along the bottom edge of your third piece of vinyl using a very long stitch about 1/8" from the edge. This creates your third pocket. Trim your interior fabric to the bottom of your third piece of vinyl, squaring up the length of the entire interior of the organizer. 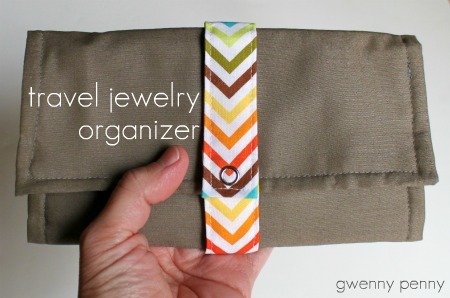 Move all three zipper pulls to the center of the organizer. Baste along the entire length of both the left and right sides about 1/8" from the edges. 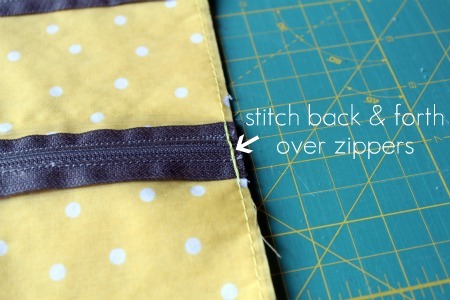 Go back and forth a few times over each end of the zipper when you do. 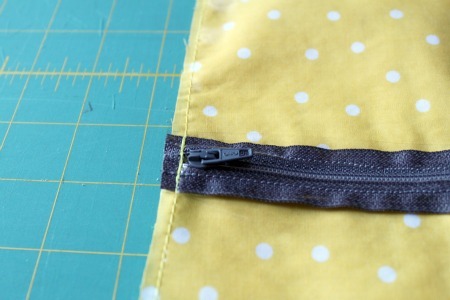 Clip the ends of your zippers and any overhanging vinyl even with the edges of your interior fabric. 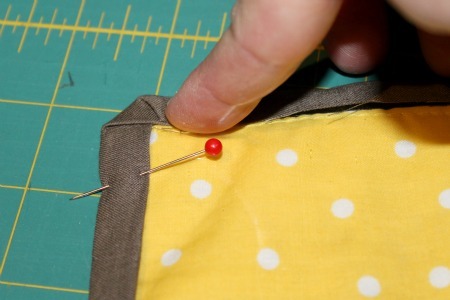 If you would like to, you can divide the top pocket for earrings and/or rings. 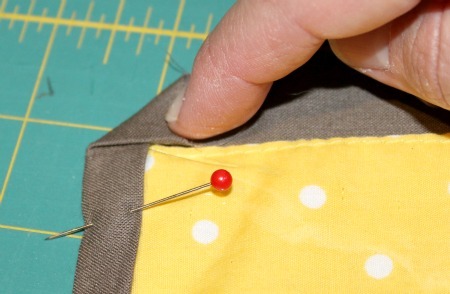 Just sew a vertical line half way between the left and right edges of the pocket, being careful not to sew over the zipper. 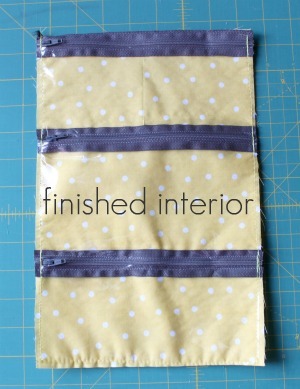 The interior of your organizer is complete! Let's move to the exterior. Step 7: Start by cutting your exterior and strap fabrics. 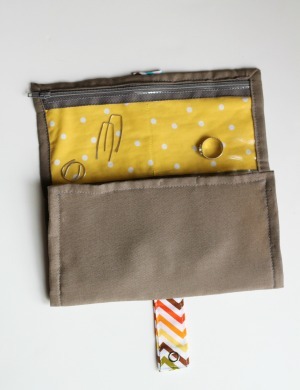 Measure the interior of your organizer that you just created. Mine ended up being 8" x 12". 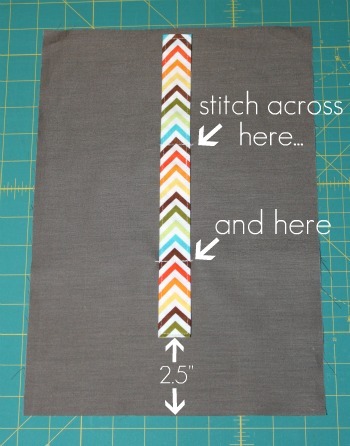 Add 1 1/2" to each dimension, and cut your exterior fabric. For example, I cut my exterior fabric 9 1/2" x 13 1/2". 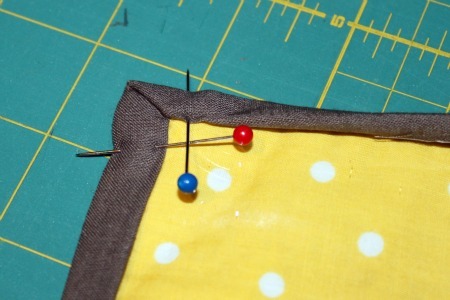 Cut your strap fabric 4" x 12 1/2"
Step 8: Start by making the strap. 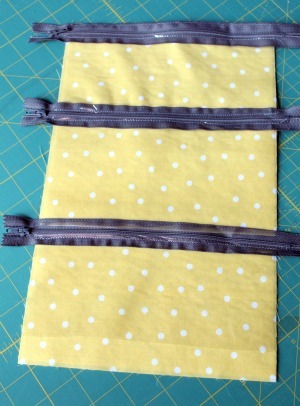 Fold your strap fabric in half lengthwise wrong sides together and press. 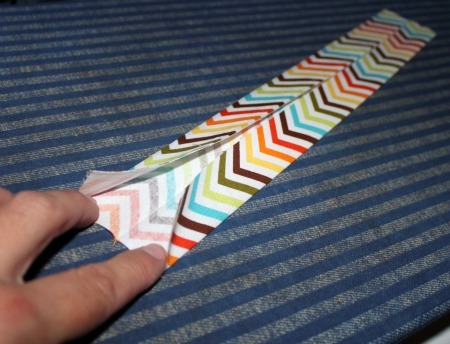 Open it up and fold both long edges into the center crease. Press. 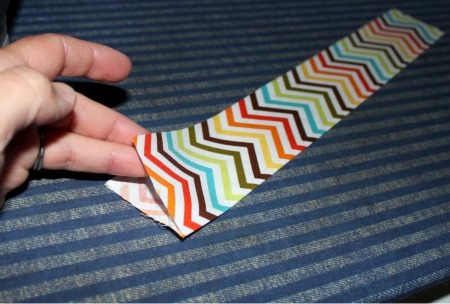 Fold the entire length again along the original crease and press. Open it up again and fold both short edges in about 1/2". Press. Refold the entire length and press the entire strap one more time. Topstitch around all four sides about 1/8" from the edges. Step 9: Now it's time to attach your strap to the exterior fabric. Lay your exterior fabric right side up. 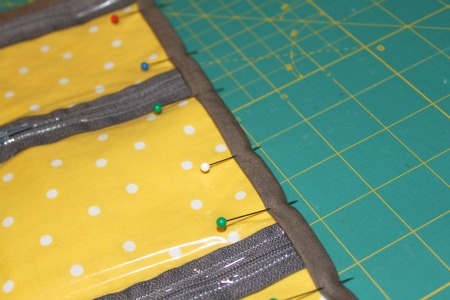 Center your strap horizontally on top of your exterior fabric (your should have about 4 1/4" on either side of the strap). 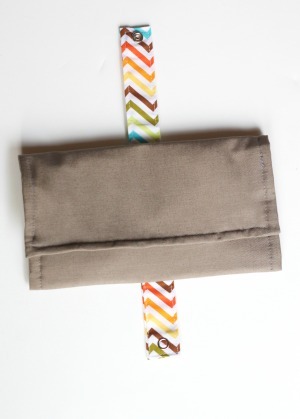 Place the bottom of the strap 2 1/2" up from the bottom of your exterior fabric. Pin in place. Sew straight across the strap in two places: first about 5" up from the bottom of your exterior fabric, and second about 4 1/4" down from the top of your exterior fabric. Step 10: Let's assemble this thing! Lay your exterior and interior pieces like so. Flip your exterior piece over (left to right NOT top to bottom) so that the strap is facing down. Center your interior piece right side up on top of your exterior piece. 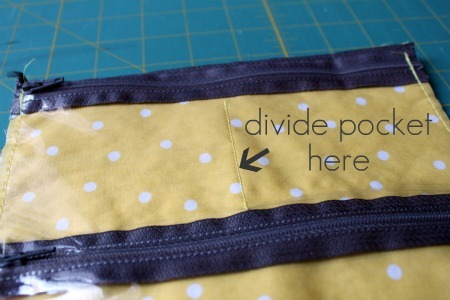 You should have about 3/4" of exterior fabric peeking out on all four sides. Make sure your zippers are still in the middle, unzipped half way. 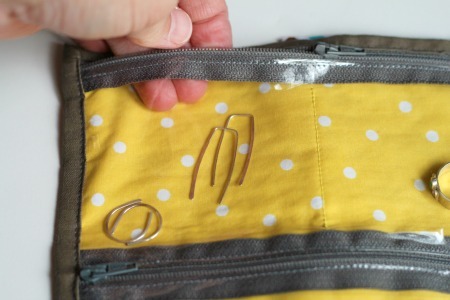 Pin the ends of your strap together on the back so they won't get caught up in the binding process. If you are adding a label, pin it on now. Starting on one side, fold the raw edge of the exterior fabric in 3/8" so that it is touching the raw edge of the interior fabric. Fold the exterior fabric over another 3/8" onto the interior piece. Pin in place along the entire length of that side. ... fold the corner down so that it lines up with the raw edge of the interior fabric along the adjacent side. 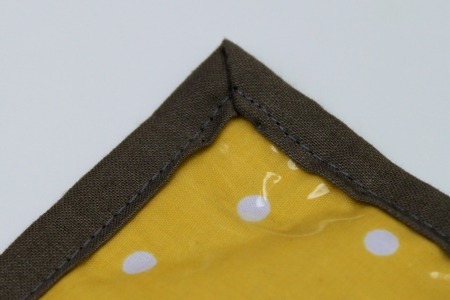 Fold the raw edge of the adjacent side in 3/8" so that it is touching the raw edge of the interior fabric. Fold the exterior fabric along this side over another 3/8" onto the interior piece. Pin in place along the entire length of that side. Repeat for all four corners/sides. 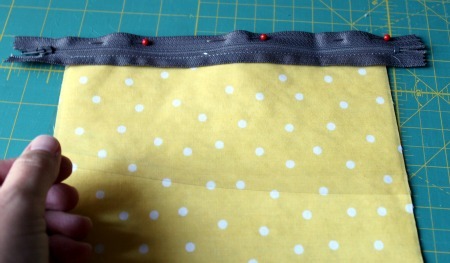 Sew all the way around about 1/16" to 1/8" from the inside edge of the binding. 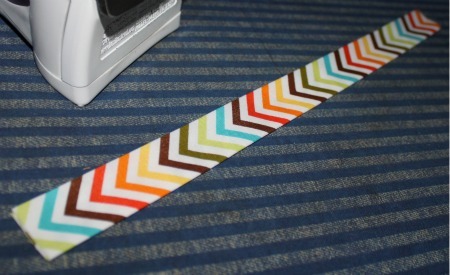 Step 11: I would wait until the end to add the snap (or hook and loop tape) to the strap. Variances along the way can change the best placement of the fastener. At this point, fold up your organizer. First, fold the bottom edge up, just above the third zipper. Then, fold the top edge down. Pull the bottom piece of the strap up, and bring the top piece of the strap down over it. Mark the placement of your snap (or other fastener), and attach following the manufacturer's directions. Voila! You're done! 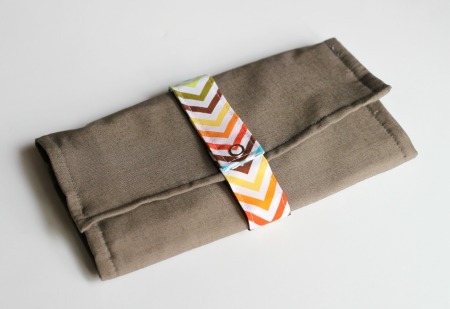 You now have this cute handmade organizer to give to someone special (or everyone :) on your gift list. You could even include a nice pair of earrings or a necklace as another special treat when they open it up. Awesome project Gwen! I think they definitely would make great gifts, but first I think I need to make one for myself! What a great tutorial Gwen! My mom had something like this when I was growing up, and I loved to look through all her jewelry in the clear pockets. I seriously love this tutorial. It is on my list of things to make. Thanks for using it my Handmade Christmas series. I love your tutorials!! Cool blog! 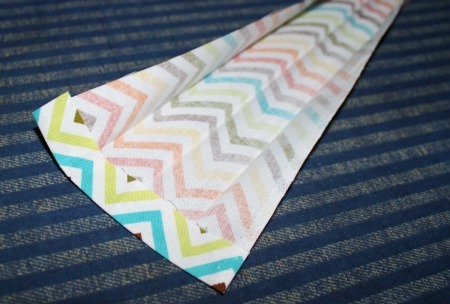 So I would REALLY love to know what that multicolored chevron fabric is called. Love it! And is that a brown cross-weave you used for the outside? I really liked your fabric choices. Too late for this year, but I'm pinning this to make for my MIL next year for Christmas! No worries - found it! Thank you so much.